Today is a very special day for our community: 100 years ago on March 25 we celebrated the first Eucharist in Sacred Heart Chapel. The Sisters had been dreaming of a new and bigger chapel since 1911 and it finally came to fruition in the fall of 1914. "All the Sisters agreed that it must be a beautiful chapel and that it would meet our future needs." (Community Chronicles) Mother Cecilia Kapsner, S. Priscilla Schmidtbauer and the Sisters were visionaries; they could not have known in 1914 that the community would grow to 1,200 members at its peak. 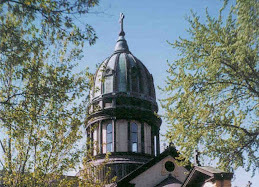 The cost of the chapel was under $200,000 at the time. 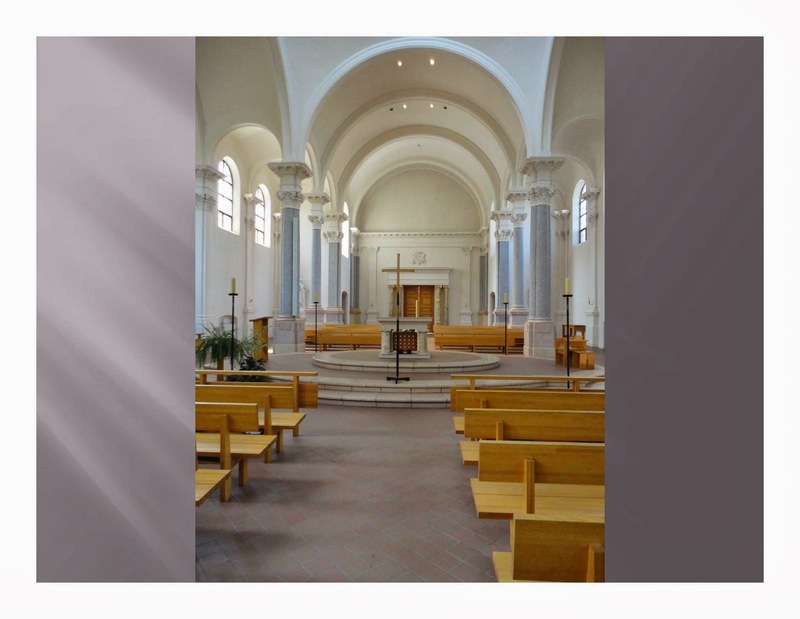 The picture on the right is of the chapel as it looked from 1914 until the 1980s when it was renovated and the picture on the left is the chapel as it is today. Sacred Heart Chapel is so much more than merely an attractive structure. Even if we refer to it as a sacred space it does not come close to conveying the full significance for us as Sisters of this Benedictine community. We read in the Rule of Benedict today, Chapter 43, that nothing is to be preferred to the "work of God" which means for us praying the Liturgy of the Hours day after day, year after year. Generation upon generation of Sisters have gathered in this chapel to pray the LOH and for Eucharist. This is where Sisters on their profession day sing the Suscipe - "Receive me, O God, as you promised and I shall live; do not disappoint me in my hope." 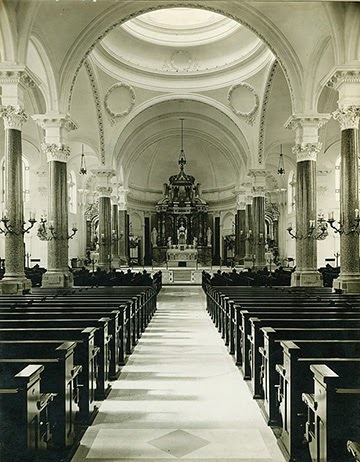 - and prostrate on the floor at the top of the middle aisle, or in the sanctuary before the renovation, while the schola and community sing the litany of the saints, invoking the communion of saints to support the new sisters and help them persevere in their call. The chapel is where we gather for wakes and funerals, and for the election of a prioress and for her installation. In other words Sacred Heart Chapel is where we come to celebrate the highs and the lows of our life together. What happens in this chapel is the glue and holds us together as a community. If you are in the area come and visit Sacred Heart Chapel and the exhibit at the Haehn Museum which will open to the public in a few weeks. What if we gave “death” another name? Many spend their entire lives trying to avoid any kind of death i.e. anything negative, uncomfortable, difficult, unfamiliar, dangerous, or demanding [Richard Rohr, OFM]. And yet, we know instinctively that we can’t actually run away from life’s negative realities indefinitely. For centuries various traditions have given us parallel words/experiences that invite us to shift our response to the death-realty in our lives. Rohr reminds us that in male rites of initiation the young boy must face death directly. Sometimes he had to dig his grave and sleep in it for a night. Those who created this difficult rite, perhaps had themselves discovered their latent capacity to bravely walk through frightening choices. I find myself asking, “How bravely can I take in, walk through and be formed by my “death experiences?” Do my daily “small deaths” ever move me to create alternate life-giving paths? For St. Francis facing the unfamiliar was an expression of “poverty”, the poor side of everything [Rohr]. Can it happen that if I choose to face the poor side within me, I can glimpse unexpected inner riches? Apparently Francis’ ability to boldly look at the poor side of things, led him to abolish fear of failure and experience immense joy. I know I would welcome the result. The question I’m left with is, am I willing to hang out with that poor side of myself long enough to receive the resulting prizes? Fasting is one of the three hallmarks of our Lenten observation. Often, in our liturgies, we hear the Prophet Isaiah instruct and test us on our motives for fasting. But do I really believe what I hear? Do I really listen to and through the words that ask me how my fasting is going this Lent? Do I make a distinction between how I define fasting and how God defines it? 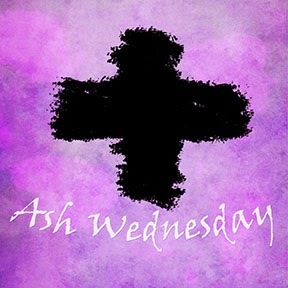 Tomorrow, March 5, is Ash Wednesday. Lent is about to begin. Many people don't particularly like the season but it's one of my favorites and Ash Wednesday is a day I really appreciate. I actually thrill to the words: "Remember you are dust and to dust you shall return," as my forehead is marked with the ashes. This isn't because I'm being morbid. It's more because it's a "reality check" - I'm human; my life on earth is finite. The unspoken declaration that it it is not so with God and that that the immortal, everlasting God can and will lift me from the constraints of my humanity hangs in the air beside the spoken words. And I feel an uplifting of my spirit. Part of the reality check of Ash Wednesday is also that I am a sinner. Now, I know the ideas of sin and unworthiness are not very fashionable at present. But I find it a relief to admit that I'm not perfect, could do better, and that God knows that, yet still loves me and will lift me up. Ash Wednesday is, for me, a call to look at myself honestly, to start again, all the while knowing that it is that very honesty, authenticity, trust in God and a determination to persevere, even when things seem difficult, which are leading me towards God. Yes, the ashes remind that I'm human and a sinner, but they also remind me that I'm a sinner on the path to finding God, the God who turns sins to ashes because, in the end, God is greater, stronger and more loving than my failings.